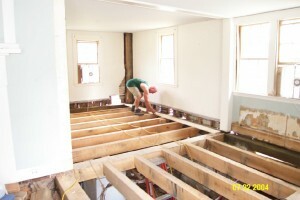 Structural Restoration Often Begins at the Sill Level. In this particular project, the entire substructure was replaced from above because the extremely large chimney bases limited access from below. Usually substructures are done from underneath without disturbing the floors. Replacement of just the sills is done from the outside with very limited disruption of the house. Sill Beam Replacement: Structural problems for old homes often begin at the sill level.Structural sills are the beams that rest on the foundation to which the rest of the house, or barn, is attached.They are usually fairly large beams (8″ x 8″ in size) because the sills have to distribute the weight of the house upon an often rough and irregular foundation.Even the balloon frame house, developed in Chicago in the 1830s, utilized a large sill even though the rest of the house was constructed of 2″ x 4″ and 2″ x 6″ materials. Sill problems usually develop from a moisture problem. Sometimes the house was built too close or even in contact with the ground. In other cases, water leaked in around windows and doorways, following the posts down to the sills.Whenever wood and moisture combine, there is the possibility of wet rot, ants, termites, or other problems. Inspections: The fact that hardwood rots from the inside out, coupled with the tendency for sills to develop moisture problems on the outside, often misleads homeowners concerning the condition of their sills.From the inside of the cellar, sills may appear to be in good condition while the outside two-thirds of the sill is completely rotted away.Unfortunately, most of the weight of many houses rests on the outside of the sill.It is a pity that many homeowners have fairly extensive interior work done on their homes without first having the structure checked.Colonial Restorations, LLC recommends that homeowners get a complete professional inspection of structural sills before making extensive renovations to a period post and beam or balloon framed house.Sill beam restoration should not be an afterthought but a starting point for the efficient restoration of the historic house or barn. Colonial Restorations, LLC helps to preserve historic homes and barns throughout the New England. We have also consulted on projects in New York state. To schedule a site visit, please call us at 508-735-9900. 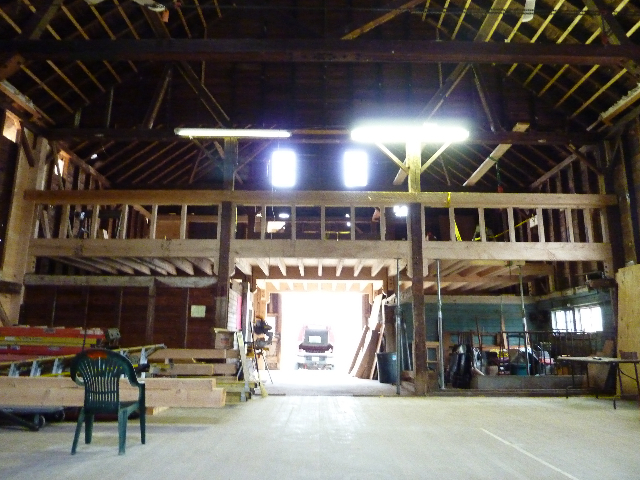 We are always glad to talk about your historic timber framed building and will answer all phone calls promptly.